Just two games into the new season the early leaders of the Premier Division supported by Sportsform league table are AFC Oakley M&DH who won 6-0 at Eastcotts AFC. Matt Barnes was on the scoresheet twice and supported by an own goal plus strikes from Nathan Aulsberry, Rob Heaney and Oli Plested. Just goal difference behind them and the only other 100% club are Renhold United who ran out 4-1 home winners over Cranfield United, Jason Allison with a brace being joined on the scoresheet by Jonny Richens and Sheldon Washington against a lone reply via Liam Whitmee-Craig. In third spot are Shefford Town & Campton who needed a 90th minute penalty strike from Adam Larsen to earn a share of the spoils in a 1-1 home draw with Caldecote who had taken the lead via Cameron McCoy. The next two spots are taken by Sandy and Ickwell & Old Warden who shared the points on The Green from a 1-1 draw, Conor Green netting for the home side against a Sandy reply from Ben Hall. The top six being made up by Wilstead who were 6-1 home victors over AFC Kempston Town & Bedford College. Michael Jones, Paul Jones, Colin Marshall, Sam Smith, JM Steele and Jim Struthers all netting for the home side against one in reply from Town’s Chris Allan. Elsewhere there were first wins of the season for Sharnbrook and Pavenham. At Lodge Road a lone goal from Shaun Barnett was enough to take Sharnbrook to a 1-0 home win over Flitwick Town. Whilst at the Warren, Elstow Abbey were beaten 4-1 by Pavenham. James Owen, Nick Payne, Jack Harding plus an own goal doing the damage against a lone reply from Harry Ellis. 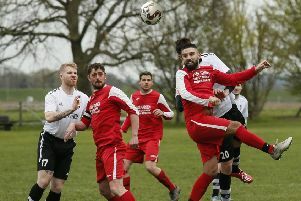 The 2015-16 Division One supported by Wests Citroen Bedford season kicked off with just a programme of five games and saw Henlow run out the biggest winners with a 3-0 victory at Riseley Sports. James Campbell netting twice and Jonathan Rowe once. However, they were not the highest scorers as that honour went to Potton Town who were 4-3 home winners over Houghton Athletic. Brad Smith, Chris Moore, Chris Cooper and Jack Hutchison all on the home scoresheet against Athletic replies from Shaun Fahy twice plus Sam Martin. Also enjoying life at home were AFC Kempston Town & Bedford College Reserves who beat Queens Park Crescents 2-1 thanks to strikes from Joseph Price and Perry Ronayne against a lone reply from Tony Millioti. The remaining two games finishing all square. At Greenfield Road, it was 0-0 between hosts Westoning and the visiting Stevington who hit the woodwork four times. Whilst at Miller Road, Meltis Albion drew 2-2 with the visiting Ickleford. Scott Alleyne netting both of the home goals against replies from John Vooght and Giuseppe Di Angleo. The game of the day in Division Two saw Atletico Europa run out 4-2 home winners over Clapham Sports. Strikes from Jasmaine Ivy, Serge Kodji, Cameron Brown and a Mo Banda penalty taking them to victory against two in reply from Marko Tobzic. Whilst for Cranfield United Reserves it was a 3-1 home win over Elstow Abbey Reserves. Ben Martin, Phil Distin and Joe Sames all netting in the opening half before Abbey’s Myles Ferraro reduced the arrears late in the second period. The lone away win of the day belonged to Flitwick Town Reserves who with a goal from Sam Johnson were 1-0 winners at Bedford United. The other two games finishing all square. At Cutler Hammer, Jimmy Grandidge was on the scoresheet for home side Kempston Hammers Sports in a 1-1 draw with Cople & Bedford SA for whom James Mead netted and over at Wootton Recreation Ground, Wootton Village with goals from Nick Burraway and Jay Rogers were leading Kempston Athletic 2-0 at half-time before strikes from Sean Lawrence and Nicholas Ememe in the second period ensured the game finished 2-2. League newcomers Wixams began life in style by running out 8-2 home winners over Renhold United Reserves. Gareth Loadman and Iain Hall both netting twice to go with single strikes from Jonny Cockram, Adam Jellis, Andy Morris and Ed Hawkes against two in reply from United’s Michael France. Also winning big were White Eagles with a 6-1 home victory over Dinamo Flitwick. Marcin Ptak leading the way with a hat-trick and joined on the scoresheet by Jacek Tereszkicwicz, Damien Krawczyk and Piotr Miciniczek against a lone reply via Dale Goldie. Another of the league newcomers to start off with a victory were Sundon Park Rovers who ran out 2-1 home winners over Wilstead Reserves. Kane Griffiths and Chris Scott netting the vital goals against a lone reply from Lewis Duffield. The days lone away win coming the way of Caldecote Reserves who were 2-0 winners at Sandy Reserves thanks to goals from Nicky Albone and Joe Barker. Whilst at Horseshoes Close, AFC Dunton shared the spoils in a 3-3 draw with Clifton. Chris Mattingley, James Fuller and Lee Marshall on the home scoresheet against Clifton replies via Charlie Roberts twice and Carl McCoy. The biggest win of the day came the way of Staughton who were 9-1 home winners over Flitwick Town A. Mark Darlow scoring three times and joined on the scoresheet with single strikes from Dan Parker, Lucas Banton, Ashlee Banton, Jake Dawson, Craig Dyball and Paul Franklin against a lone reply from a Ryan Hill penalty. Also winning big on home soil were Mid Beds Tigers who emerged 6-1 winners over Henlow Reserves. David Smith leading the way with a hat-trick and joined on the scoresheet by a penalty from Tom Hunt plus strikes from Tomas-Lee Smith and Liam Brophy. The lone reply coming from Taylor Roff. Elsewhere, Caldecote A went one better with a 7-1 victory at Lidlington United Sports. Jack Stagg netting three times, Paul Rannow twice and joining them on the scoresheet were James Whitmore and Rafe Goodman. Whilst Polonia Bedford were 3-0 home winners over Bedford Albion. Wojciech Plizga with a brace and a strike from Bartosz Sekretarski doing the damage.